Two years ago I made a video with my Five Basic Diet Tips. The tips were just common sense, really; eating fresh, unprocessed food, eating when you’re hungry and stopping when full, that kind of thing. They weren’t diet tips in the “dieting” sense (I’m definitely not a dieting person), more the “healthy attitude to eating” way – if you want to watch the video then you can find it here. My basic diet tips have seen me through most of my adult life – the years, I should say, when I have made the majority of my income from modelling, a job that has required me to keep my body reasonably lean and trim. I’ve never struggled to keep my diet on the healthier side; of course I’ve had bad days, but on the whole I’ve always enjoyed fresh, good food and haven’t been particularly partial to junk or quick-fix, empty-calorie stuff. Until, that is, I reached the last few months of my pregnancy. I don’t know whether it was pregnancy hormone-related or just because I was large and bored and couldn’t be bothered to prepare any lengthy meals or snacks, but I found myself making terrible choices. No, scrap that – choices makes it sound as though I was deliberating between healthy stuff and what I was going for: I found myself making a bee-line straight for the ice lollies, cans of coke, Haribo Tangfastics and crisp sandwiches. Oh, and takeaways. Not all the time, but often enough for it to be noticeable in comparison to my usually healthy diet. Don’t get Diet Inadequacy Syndrome. Diet Inadequacy Syndrome (or DIS) is what I have nicknamed that sinking feeling you get when it seems as though you’re just not healthy enough. You think you’re eating quite well because you’ve made a chickpea curry with rice but everyone on Instagram is eating kale foam with whispers of raw shredded beetroot. Or something. Or cauliflower as a rice alternative. I mean, what the hell is wrong with RICE? I often get really disheartened by seeing pictures of people’s dinners that consist of raw strips of vegetable with a dairy-alternative dressing and half a stuffed pepper; it makes me feel that my dinner is the dinner of a greedy, pork-faced medieval king. Half a stuffed pepper and some veg would never see me through until breakfast (though each to their own, for some people it seems to suit them down to the ground) – so eat what you need to eat, but eat fresh and eat unprocessed. You’re having your pepper roasted and with some linguine? Cooked with a bit of garlic and chilli and gorgeous olive oil and tossed with rocket? Parmesan shavings on top? Bloody well go for it. I’m having that too. Not every night, but I certainly don’t see that as an unhealthy meal. If we all go around thinking we’re only healthy if we swap our linguine for shreds of courgette (good alternative, by the way, but sometimes you just need – and want – to boil the pan and chuck some spaghetti in!) then we’ll feel so inadequate we’ll just give up completely and slide into the land of fast food and quick fixes. I suppose this goes back to my first set of diet tips: cook unprocessed food, plonk in a fair bit of veg, get your protein and you’re on the right track. 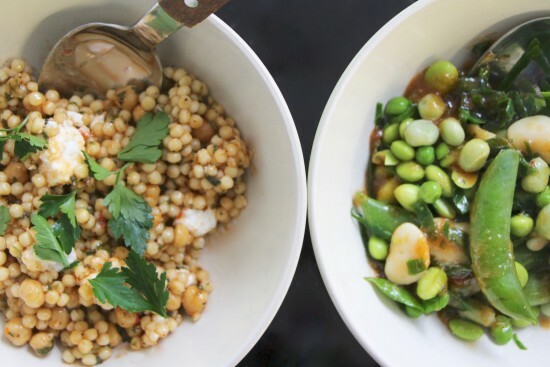 Make lentils and chickpeas your friends. I chuck lentils and chickpeas into everything. You can get these Merchant Gourmet pouches of puy lentils and Beluga lentils and I add them to pasta sauces if I can’t be bothered to boil a pan of water for the pasta. Puy lentils are amazing with a spicy, garlicky, black olive-strewn pasta sauce. Then I just chuck some goat’s cheese on top and have it with a salad, like a kind of mediterranean stew. Chickpeas get thrown into leftover curries on a regular basis – they bulk it out so that you can stretch to another full meal and they are really filling. You can keep cans of chickpeas and lentils in your cupboard for years, so there’s never any excuse not to have any. Which is partly what I like about them – always to hand. Also, they are nutritionally pretty great – good source of lean protein, dietary fibre, etc. Stop the “treats as a reward” thing. I never ever used to use food as a treat or reward, but since having a baby I’ve looked forward to a pudding (usually a Magnum ice cream) every single night. I had been convincing myself that I deserved it – “my only vice!” I would happily squawk. But it’s a dangerous slope, using food as a reward. It gives things (usually bad things) a status they don’t deserve. Yeah, a Magnum is a treat (man, how I love them) but I don’t deserve one every night, that’s just stupid. I deserve a bath, some quality time to do what I want to do – I deserve to read a book or congratulate myself on a day well done, but rewarding myself with foodstuffs is just creating an emotional bond with a sugary, high-fat, meaningless treat. Bad news. Because then there’s the lunchtime treat for getting through the morning, the mid-afternoon treat for beating the energy slump, the morning treat-with-coffee because you walked to the station. I’m not saying that treats shouldn’t exist, it’s just how – mentally or emotionally – you use them. Have it because it’ll taste nice and you fancy it, not because you’ve found some crazy justification as to why it’s OK.
Planning to avoid health food panic. Do you ever desperately scour the supermarket aisles in a tizzy trying to remember what (other than fresh fruit and veg) is considered to be healthy to cook with? I think that it’s really easy to become so confused about what to buy, especially when you do the shopping hungry. What usually happens is that you give up on trying to work out the new things you need to buy to be “healthy”, resorting to your tried-and-tested favourites, which means that you never really expand your repertoire. I’ve decided to get organised and scour my cookbooks before I go shopping so that I know exactly what I’m going to cook and what I need to buy. I’ve always done a form of meal planning (in my mind!) but I think it’s time to get organised and write some lists. If I always have the right basics and just need to add my fresh stuff then I think I’ll be on a winning streak. *UPDATE: Anna from Vivianna Does Makeup has made a whole video on meal planning here, some great tips. What do you reckon? These little rules are working for me. Anything you’d like to add?